Denna Secret Paths är gjord i Scheepjes Whirl, 789, Tasty Nom Nom. Mer information om just denna sjal, så som virkfasthet, storlek, nål etc, hittar du här. This Secret Paths is made with Scheepjes Whirl, 789, Tasty Nom Nom. You can find more information about this shawl, such as gauge, size and hook size here. Till denna vita-rosa sjal använde jag garnet Cotton Flower 200 g från Favoritgarner och virknål 4.0 mm. Du kan använda vilket garn du vill och addera eller ta bort varv, tex varv 5-18 som upprepas, för att få rätt storlek. Se bara till att avsluta med ett popkorn-varv innan du börjar med kanten. For this white and pink shawl I used the yarn Cotton Flower 200 g from Favoritgarner and hook 4.0 mm. You could use any yarn and just add or exclude rows, for example row 5-18 that is repeated, to make it the right size. Just make sure to end with a popcorn-row before making the edge. © COPYRIGHT Mijo Crochet, all rights reserved. This patterns is for personal use only. I love your pattern and can’t wait to try and do it. Thank you so much for the pattern of this beatiful shawl!! Love the pattern and can’t wait to make it. I am in the USA. Could you tell me how many skeins of yarn you used to make the shawl? Also, I am not familiar with the yarn you used – is it a light weight yarn? Thank you for your help. My mother is making the secret paths sjawl, and its turning out amazing! She had 1 question though: the edge of the sjawl is coming out a Little bit different. The gaps in the photo of your plum/purple sjawl look larger then the edge of the pattern she is following. Did you use a different pattern for that one? Because we love how that one looks! Hi! Im happy you like the pattern 🙂 Yes, on that shawl I used the edge from the Taiga shawl – Royal Starling edition (without the picots). Im sorry, I dont understand your language….But your comment looks very nice and friendly, thank you! Hi Johanna, just a note that I came right and are very excited. Will comnent after completion. I stuggled in the beginning but then downloaded the Dutch pattern and it had a diagram which I understood clearly. I am currently working your pattern in English. I can’t seem to find the instructions for the popkorn stitch. I can’t follow the link in the pattern because it is a .pdf. Would you, please, help me? OK. Must be losing my mind completely. When I looked at it the second time, Row 3 was there! Please disregard previous post. Thank you for the totally lovely pattern. You have a great talent. I really love your patterns :-), and recommend to any fellow crochet addict I might meet on my way. For this shawl, the secret paths, is there a diagram , like the one you have made for the lost in time. I am not very strong on reading an instruction, and find it so much more effort less to crochet from a diagram/picture, than from a text, with pattern written out in words. Im sory to say that I dont have any charts. I dont make them anymore since they got abused and shared/posted on pinterest, FB-groups and other websites without my knowledge. Большое спасибо!Очень понравилась ваша работа. It took me a while to get this done, but it was worth every minute and effort! Beautiful & amazing pattern! Thank you! I like your pattern but I just knit. I don’t know to do crochet! Can you explain how to do it in knit? i really am struggling to undrtstand the beginning. as you begin with the circle and just move in the round to 2 ch space and repeat to 3 ch HOW do I turn the work? I pulled out 3 times already as the fp dc and bp dc is at front and back not on one side? Sorry I am so confused but I reaaaaally want to master this? I cannot seem to get this pattern to work. One side is perfectly straight, on the other I seem to be adding more stitches so it is not level. Can you help?? Just finished row21 and I have 77 one side 78 the other. Also, are the 4 chains at start of row 7 counted as one double and one chain space? Cannot get this right at all! I’m going to have to give up! could you explain what you mean on row 7 thin? row 15 thin 3 bfpc? I really dont know where you got these “thick”, “thin” and “aft” words from, its nothing I use in my patterns. I also use pop instead of pc. Are you refering to any of the translations and not the english/US pattern? Or maybe someone posted another (not mine) version of this pattern somewhere? Wendy, do you mean “fpdc” and “bpdc”? Those are terms meaning “front post double crochet” and “back post double crochet” (defined at the very beginning before the pattern starts in the pdf). That means basically you do a dc around the post either from the front (fpdc) or the back (bpdc) to create a depth to the work. Those techniques create the “thin row”–it’s actually the top of the previous row, because it’s been pulled forward or back, depending on if you do fpdc or bpdc. I truly wish this amazing pattern had a tutorial video for those of us who struggle with written patterns or have recently picked up the craft ! Please consider it ! is there a chart for Secret Paths? Don’t even care what language it is. Hi Jo, there is no chart for the Secret Paths pattern. You are the goddess of the hook. I knit this bactus now and enjoy the process, thank you! Awesome pattern. I’ve made it twice now. But how did you make the tassels ind the photo? E’ molto bello. Peccato che è spiegato in molte lingue tranne che in italiano. Congratulazioni e buon lavoro. Would you consider some help in translating your pattern into Italian? Do you mean that you like to help with the translation of the pattern? Sure. I would gladly help, if you like. what does the rd stand for or what am i supposed to be doing on this part. Thank you so much for your help! I have a question – does the project curve? Do you have a count of stitches for each round? Each row increases by 4 stitches on each side of the shawl, and you will always have an uneven number of stitches on each side. Hi, really loved your shawl and trying it in my way but i was wondering if you could help and tell me whats the perfect length for this shawl to suit a large size lady. Hi and thank you! I think that depends on how she would like to wear it. Around her neck like a scarf or over her shoulders. If over her shoulders it needs to be bigger. I think the safest way to be sure is to ask someone to try it on if that is possible. You’re right.. thank you very much for your helpful way and your lively designs. I’d love to make this as a gift for my sister. I’m wondering about the amount of yarn. In the pattern it calls for 200 g of yarn. The yarn I’d like to use is 141 g per skein and they are 215 meters. Would two skeins be enough for this pattern? I don’t quite understand the conversion of grams to meters. Thanks in advance! Is there a row by row stitch count for Secret Path? That would probably help me so much. Hi, I’m Gabriella and I’m working on the Italian translation of the Secret Path pattern. I have a question: you have to make two parts and then sew them together to make the “tip” of the shawl? No, you crochet the shawl in one piece, like a triangle or half square. Just in the third ch on previous row. The ch3 in previous row counts as 1 dc. 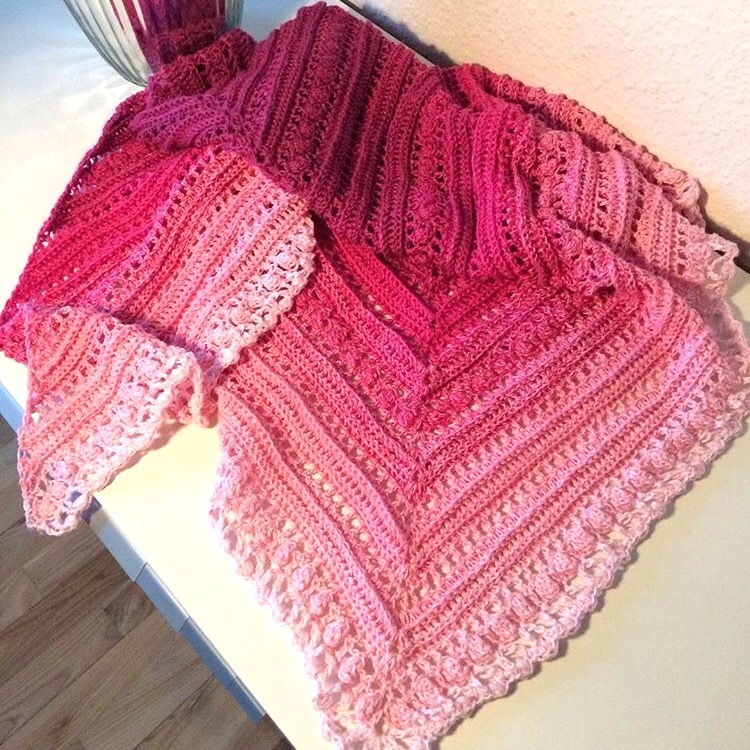 Johanna, I found one of your designs by chance and I fell in love with them, I made the shawl secret trails and I loved it, I shared it on instagram and I labeled you as author, I would like to know if I can make some and sell them but indicating that they are made with patterns of your autorship ?? ?